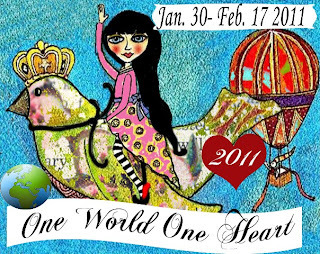 Giddy Greetings: One World One Heart Event! 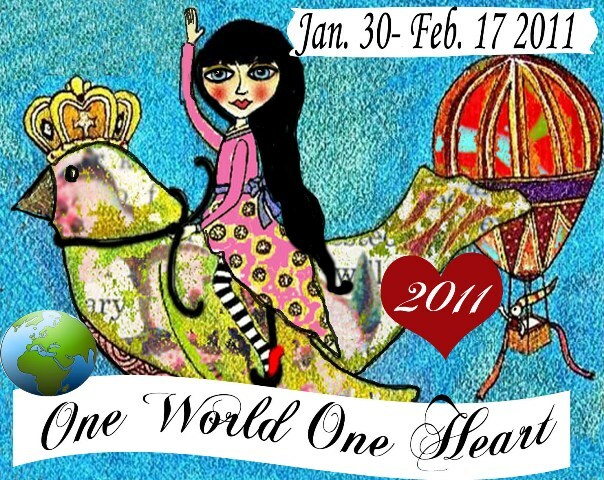 One World One Heart Event! Thank you to all of you that visited. It was nice to meet all 871 of you! You can see who the winners are by visiting here. This post will remain on top until February 17th. Don't forget to comment to enter your name in the drawing! Lisa created this event in 2007. The original idea behind this giveaway event was to bring bloggers together from around the world who may never ordinarily meet. It closes the gap of the blog community and enables us to interact, discover new and wonderful people, and in the process possibly win a prize or many prizes along the way. 2007 had roughly 85-90 participants and many connections were made because of it......friendships that are still going strong. There was a strong showing the first year for sure, and then in 2008 had just about tripled that number. In 2009 there were 911 participants and 28 countries were represented in the 2009 event as well. This is more than wanting to win something.......that is only the means.......in the end it's about finding kindred spirits. Someone who may be fairly new to blogging, not sure how to navigate, find others and have others find them....Some are long time bloggers and in some cases well known in the blogging community. Whatever the case it brings all of them together. This is an INTERNATIONAL event that has and had participants from the US, Canada, France, Sweden, Germany, Finland, Malaysia, Brazil, The Netherlands, Australia, New Zealand, Scotland, Ireland, England,Wales, Slovenia and more. It transcends geographical location, socio economics, political affiliation, religious beliefs......it's a coming together like the giant community we are on this planet. If only it took a simple giveaway to create PEACE everywhere, in the mean time here we give from our hearts. We are not solving the worlds problems nor are we curing anything nor are we changing the world. We are merely generating a closer community between humans through blogging. This is the 5th and final year of OWOH so thank you Lisa for another great event for the chance to meet new people and gain new friends. Leave a comment to let me know you were here. I promise to go visit your blog too. This is a international event so anyone can enter. I will draw the winners (there will be 2) on February 18th and I will let the winners know via email. Thanks for stopping by, it's nice to meet you! My first giveaway are some delicate paper roses. I just started making these so you get my first set! They measure approximately 2 inches. My other giveaway are some grungy quilled flowers and a dragonfly. They also measure approximately 2 inches. love your roses, and reading about people meeting through blogging is great. I am a newbie blogger and enjoy checking out what everyone is doing, it's very inspiring! Thank you for offering this item up! Both of the items are sweet but those roses are just gorgeous! Thank you for being apart of the OWOH journey! Your paper roses are lovely! What a fun blog! All kinds of stuff to see! Gorgeous giveaway ! i love this!!!!!!!!! What beautiful giveaways! I love your quilling. Fabulous! I am #249 on the OWOH list. I'm loving the quilling! Amazing work. Greetings from Canada. Nice giveaway! Visit me at #336 at Shimmer and Tulle. Stop by and enter my OWOH! I'm #50! Hope you have oodles of fun during OWOH. I've enjoyed it so much over the years. What a wonderful blog you have. Thanks for your generosity and participation in the event. Love your creativity. Ilove your quilling. Count me in please. Hi there, so nice to meet you! Your giveaway is wonderful and gorgeous, would love to be in with a chance to win! I particularly love those roses!! I haven't tried my hand at paper roses yet, but it is something I want to give a try because they can be very beautiful! Please put me in the pot for your OWOH Door Prize! Love your giveaway! Those paper roses are too pretty! Wow, your flowers look REAL! Oh, you are so talented. Thanks for sharing your art with me. I truly enjoyed looking at your blog. boy these are pretty flowers! Very sweet giveaways! Count me in! Hi Monica. Thank you for inviting me to your Blog. Your items are lovely! I've made a couple of paper flowers but not to your level yet. Monica, what wonderful pieces of artful flowers. How would you choose. Thanks for stopping by my blog through the OWOH event. This is my first and I'm having such fun getting to know everyone. Cheers. Your papaer roses and quilling is beautiful. Please e enter my name for the draw. Thanks so much. Would love to win one your awesome creations. Wow! What you can do with paper! I'm stunned by your roses and the quilled flowers. And I'd lov to welcome any of them to my home. Greetings from a fellow blogger/crafter in the UK. I enjoyed my visit and your give-away is beautiful and unique. Thank you for participating in this amazing journey of joy. your roses are beautiful! Thank-you for the chance to win..
Hi Monica, so lovely to meet you! Please add my name for your giveaway, I would so love to win either of your prizes:-) Your paper roses are absolutely gorgeous!! So very nice to meet you... I am having so much fun reading all the wonderful blogs.. Thank you for visiting my blog, I truly hope you enjoyed it. Please come back anytime. The paper roses are stunning, very beautiful. Pleased to meet you Monica, your work is gorgeous, Lovely inspirational Blog. I am not a quiller, buthave tried it so I admire your hand at it. Keep smiling and creating. Hi Monica.. so nice to meet you.. lovely quilling.. always excited to meet another quiller.. thanks for stopping by my blog..
Greetings from Pennsylania USAI love things made out of paper, especially flowers...have made some beautiful origami ones as gifts over the years. I have a few books on making paper flowers. I hope to win one of your beautiful roses. I'd like to learn how to make them so I can make and give them away.....after putting some rose scent on them! Ciao! I am so happy to meet you today on the wings of OWOH! Thanks for a chance to win your wonderful giveaway.. you make such beautiful paper roses and your quilling is sweet!! Please stop by #153 for a chance to win my quilled giveaway! Hi Monica! Your paper roses are beautiful, and of course your quilling is always gorgeous! Hi Monica, love your flowers and quilling! What beautiful creations! I love the roses! You do beautiful quilling and those paper roses are lovely. your paper roses and quilling are all so beautiful!! warm hugs & blessings from Montana. Simply charming! So nice to meet you! I am totally impressed with your work. I love the beautiful gifts you have chosen for us, too. I'm number 11 and hope you drop by. Your paper roses are so delicate and beautiful, but that quill work - specifically the dragonfly stole my heart. I'm thrilled at the chance to win. Hello from Florence,Oregon. You do beautiful quill work. Please add my name to the hat. Oh how beautiful. I'm off to wander round your blog. Beautiful blog you have here! And I love the paper roses, I'm about to give them a try. I've done some quilling too...it's a ton of fun. I'd love it if you would include me in your draw. Thank-you so much for visiting my blog. Thanks for stopping by my blog. Nice to meet you! Lovely giveaways - please add me to your drawing. What a delightful giveaway. Your flowers are just darling. I enjoyed poking around your blog. You do some lovely work! Love your roses and quilled flowers... and of course the dragonfly! I tried quilling several years ago and can truly appreciate what you've made. It takes lots of patience. Happy OWOH! Hi Monica, Thanks for visiting my blog and for your kind words. Your paper roses are beeeaaauuutiful! Happy OWOH! Those are cute!! count me in! Wow what a wonderful way to bring people together. Amazing! I am so glad I stumbled upon ur blog. Thank you for the chance to win but moreover, thanks for the beautiful thing you are doing around the world. Hello and it is so wonderful to meet you. I would be so excited to be a part of your OWOH blog giveaway. Please come and visit during your journey through Blogland. Well, hello there from snowy Arkansas! Please enter me in your fantastic giveaway and if you haven't already, be sure to stop by my blog and enter my giveaway, too. #215 on the list. Oh! Both the paper flowers and quilled flowers and dragonfly are beautiful! Please count me in. Thank you! they are lovely and a lovely addition to my scrapbook if I win! I would love to be entered in your wonderful drawing, if you get a chance please stop by my blog it is #809 on the OWOH tour. I really never did learn the art of quilling. It looks like you need patience to perform this type of art! Your blog is wonderful, and I've enjoyed looking at your tutorials! bloghop I've joined. Please stop by my blog. monica - thanks for stopping by my blog and leaving such nice comments - and please toss my name in the hat for your wonderful giveaway. Your roses are beautiful, and your quilling is fabulous too! Thanks for the chance to win! What beautiful flowers, please enter me in your drawing. Hello from Cody, Wyoming, USA. I enjoyed visiting your blog and getting to know a bit about you. Your blog is lovely. Thanks for participating in OWOH. Please enter me in the drawing for your roses and quilling pieces. I'd love to enter your wonderful giveaway! What cool work! I'd love to win either of these treasures. Hey Monica, thanks for visiting my blog! Your prizes are pretty fabulous! Those paper roses are gorgeous! It's a pleasure to meet you. Thank you for your lovely offerings. You have a special talent! Please enter me into the OWOH give away. I hope you will visit my blog, too. Greetings from a tatter in Singapore. Please include me for the drawing! Thanks for the giveaway! The flowers are so beautiful and unique! You have AMAZING fine motor skills to go with your talent to produce your gorgeous work, not to mention a dash of patience I bet!!! I'm pleased to meet you (I'm Shelle from Sunshine Coast Australia) If you have time (I don't think I've seen you visit, but could be just dazed from dancing around the world LOL) I'd love you to come on over check out my giveaways & comment at my OWOH post too :) oh & please feel free to drop in now and then after OWOH if you're in the bloggersphere :) that'd be cool! Now let's enjoy this hurly burly wonderful One World One Heart EXTRAVAGANZA :) There's lot's more blogs, I feel like I'm in a marathon LOL!! Up, UP & AWAAAAAAY!! Hello, it's been a pleasure meeting you. Your paper roses are so elegant and the quilling...wow! I don't know how you guys do that. I hope I'm one of the winners of this fabulous offering. This is a beautiful giveaway. My mother is a sometime quiller and I really admire it. Thanks for stopping by my blog, I enjoyed looking around here and I will be back after OWOH. Hello, it's nice to meet you! Your roses and quilled flowers are beautiful! Wow, those roses are gorgeous! I just love quilling, something on my list to try and learn! lol Great to meet you, hope you've been enjoying OWOH!